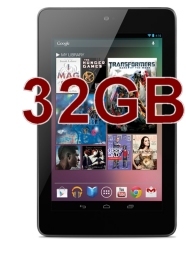 Retailers in the UK have today started selling a 32GB version of the Google Nexus 7 tablet for around the £199.99 mark. Currys, PC World, eBuyer and Very.co.uk have all currently got stock and selling online. We got wind at the weekend this was coming with reports of shady under the counter deals involving a 32GB Nexus 7 device from a large high street retailer! In the end yesterday it was a low key official release from Google after a high profile launch event in New York was cancelled due to the impending Hurricane Sandy. As well as the 32GB Wi-Fi version, they have also released a 32GB Wi-Fi and Cellular version which will work in conjunction with mobile data networks (with additional subscription). We have not yet spotted any UK retailers selling this device yet but it is expected to sell for around the £239.00 mark. The 16GB model will continue to be sold at a reduced price of around £169.00. Some retailers have already reduced their prices however there are still quite a few selling at £199.99 which is the same price as the new 32GB model! Buyers beware. Google also announced the Nexus 10 tablet which will have 10 inch screen with a resolution of 300 pixels per inch which is higher than it's competitor the new 4th generation Apple iPad. Due for release on the 13th November a 16GB version will cost in the region of £319.00 and a 32GB version £389.00. Why is the Nexus 7 so hard to find?